Two “new” finds today – I’m on a roll. This little frock caught my eye because of the fabric – real, plush, beautiful VELVET. We just don’t see that anymore. The lace trim is also very nice. Stiff and Elizabethan. Aside from the fabric, it’s just as cute as can be and oh, so of that time. Mini, slightly Mod but also demure. I love it and it was worth snapping up even if it isn’t quite my size, just for the fabric. I’m showing these dresses together because they have so much in common. The biggest similarity is the heavy-weight knit fabric that was so characteristic of clothing made between 1973 and 1976, more or less. It is beautiful, sheds wrinkles and drapes like a dream. These examples are not high-end, but are very well-tailored. Neither has a label, so I’m not sure if they might have been custom-made. In any case, the original owner of the red one altered the hemline at some point. Both still have about 3″ of hem allowance (such a luxury!). I haven’t tried them on yet, but predict that they will fit me and will be very flattering. 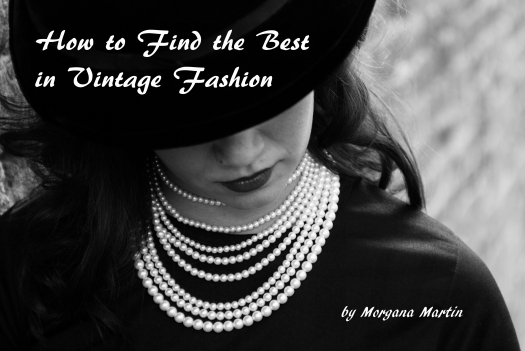 Well-made garments of quality fabric and good design usually are – another reason why I adore true vintage fashion! SO UNUSUAL – 1960’S VELVETEEN MINI MATERNITY DRESS! What a surprise to come across this custom-tailored frock. It’s got many clues that told me of it’s age and how it came to be, but the styling was the real delight. SO unusual to discover a maternity dress or a “tent dress” from the mid-1960’s. Tent dresses were all the rage for a while during the Mad Mod Sixties. Fortunately, the style didn’t hang around too long. But, what could be more perfect as a maternity design? This one is meant for fall and winter partying in heavy velveteen. I have to say, it is cute on Stella. After discovering a treasure like this, I wondered what could be next and it didn’t take long to find out. Stay tuned . . . . . . . . . . . . . . . . . Dark navy and white, with clear buttons all-the-way down the front. Almost a tea dress, but very North American. So smart not to spoil the print and pretty lines while still making it super-easy on and off. I really appreciate the good tailoring that could still be found on low- and mid-priced dresses in the Seventies and early Eighties. Love the nipped-waist fit and cute pocket flaps at the hips. It’s a simple dress, but with so much FIT and figure-enhancing detail. It will be another go-to frock on hot days this summer. Soon we’ll be heading into Fall and even Holiday styles – stay tuned . . . . . . . . . . .
I’m appreciating the crisp transitional temperatures and rain right now, even though it seems cold for May! I know many people are experiencing this all over the world. Makes me want to show my wonderful capes, which are great for this type of weather. From the 1960’s, one is in always-wonderful-red kind-of traditional/military style and the other a blue & green reversible paisley pattern with an open front and decorative string tie. Like a bright hat, either of these makes a big impression on the street. Both are wool, so provide warmth while the loose fit keeps it from being too hot and can be worn over just about anything. Just right!